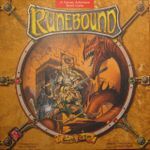 I never thought I would do it...but here I am offering some great dungeon-crawlesque/fantasy games. 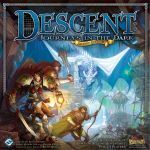 These are Descent 2.0 and Runebound 2nd edition. I also have industrial Waste up for grabs. My games come from a smoke free home. I will ship using USPS and these will be shipped from TX 78214. I will accept Paypal as a form of payment and even e-gift cards from Amazon. All games will go through BGG marketplace in ONE BIG ORDER after the sales have been wrapped up. I will ship only to U.S addresses at this time. This auction will end on NOV 1st 2013 at 7pm. I will give you a little back story..I was anticipating this game for so long and have only had played it about 7 times. It seems that only my interest for this game was high. My wife completely forgot about it. So instead of looking at it I have decided to purge it. The Conversion kit for extra monsters and heroes. The larger cards have all been sleeved with FFG sleeves and the smaller ones are bagged. I threw out the original insert and have replaced it with a simple foam board one I made. The bases for 4 medium monsters have been replaced with sturdy magnetic round bases. I did this because the original ones would bend and not stay flat. The original box for the conversion was thrown out and will not be included. BOX weighs in at 6lbs 6oz. Another departure in my collection. Its good but lasts a little too long. The game box has shelf wear with whiting on the corners. All corners are intact but the box could be better. The components look great though. This version has the stickered indented dice. I have wrapped the cards in Hugo's Amazing tape so the cards should not slide around. Pretty neat looking game. Missing 2 yellow barrels and 2 blue ones as well. I will throw in 4 cubes to use as proxies. complete with all cards accounted for. Scuffed on box but cards look great! game is in good condition with no split corners. played roughly ten times.